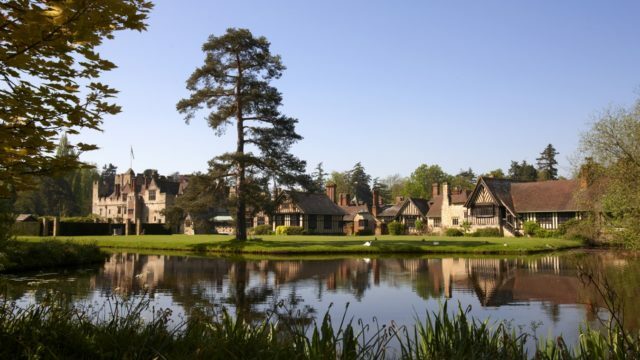 Surrounded by glorious Kent countryside, Hever Castle’s B&B offers 28 luxury bedrooms in the Astor Wing and the Anne Boleyn Wing, both Edwardian Wings, designed in Tudor style. View our accolades here. Bookings in the Astor Wing can be taken eight weeks in advance of the date you wish to stay. The Astor Wing offers a beautiful panelled lounge with deep sofas and a selection of books and magazines for guests to relax with during their stay. There’s also a rather splendid Billiards Room to be discovered. Bookings in the Anne Boleyn Wing can be up to six months in advance of the date you wish to stay. The Anne Boleyn Wing enjoys its own beautiful Breakfast Room which is flooded with natural daylight and offers window seats looking out across the orchard to the Castle. Guests who book an Anne Boleyn Wing bedroom will have access to the Astor Wing Lounge and Billiards Room on dates when there are no private events booked into the Astor Wing. Enhance your stay by pre-ordering one of our luxury packages to add that special touch. A ‘Full English’ breakfast is included with every stay, complemented by a healthy ‘Continental’ buffet. Read about lunch and dinner options here. All bookings receive complimentary access to the Castle and grounds during opening hours on the day of arrival, the day of departure and all days in between. Outside of opening hours, guests can enjoy access to some parts of the gardens. If the Bed and Breakfast is available on days when the Castle and gardens are closed to the public, a Private Guided Tour of the Castle will be offered on the morning of the day of departure. 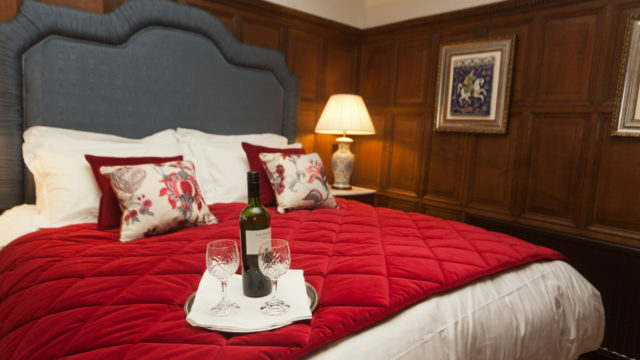 Luxury ‘five star gold’ bed and breakfast accommodation in the Astor Wing and Anne Boleyn Wing of Hever Castle, Edwardian wings of the Castle built in Tudor style. Purchase a voucher and give the gift of a luxury stay to someone you love, speak to our B&B reception to arrange. A collection of 28 luxury en suite bedrooms to include doubles twins and singles. Classified as ‘Superior, Feature’ and ‘Deluxe’ rooms. 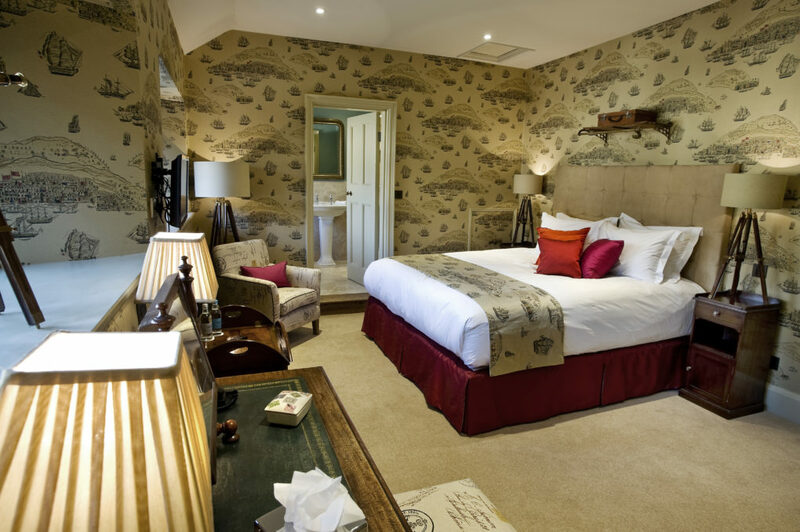 There is also a rather special Suite, the Edward VII Suite with views across the orchard to the castle. One accessible room is part of this stunning collection and family rooms are also available. I am writing to let you know how much Simon and I enjoyed our overnight stay at Hever Castle last Wednesday, 8th April. Thank you! We loved the room and thought the castle and gardens were wonderful. It was also enjoyable having breakfast in the Astor Wing and we could not fault our visit. We would very much like to visit Hever Castle again, with family members.